Wholesale Price Index (WPI) based Inflation drop to historic low of - 4.95% in August on cheaper fuel and vegetables, putting pressure on RBI to cut interest rate. The Wholesale Price Index-based inflation was (-)4.05 percent in July. It has been in the negative zone since November 2014. In August 2014, inflation was 3.85 percent. However, onion and pulses turned costlier with inflation at 65.29 percent and 36.40 percent respectively during August, as per official data released on Monday. 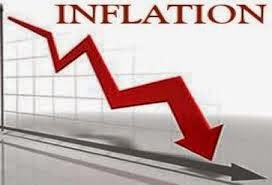 Overall, the food basket inflation remained in negative territory for second month in a row at (-)1.13 percent. For vegetables, it declined to (-)21.21 percent, helped by potato at (-)51.71 percent. Inflation rate in fuel and power segment was (-)16.50 percent, while that in manufactured products was (-)1.92 percent in August.